The NSBA Foundation completed the first Coaches Summit, which was held in Gurnee, Illinois, March 26-28, 2018. Participants represented 10 states across the country. 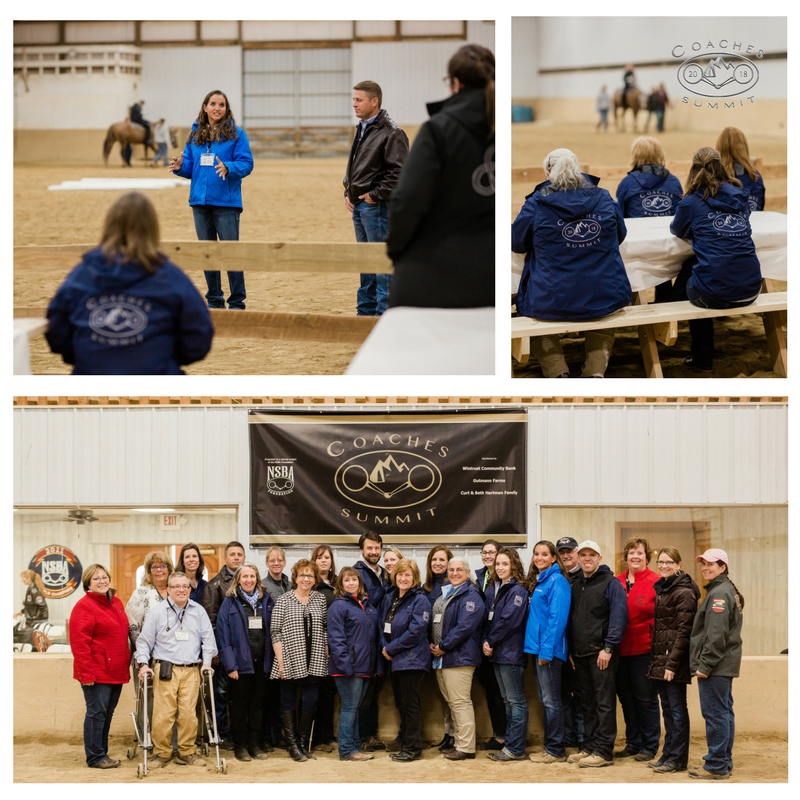 Presenters at the workshop included horse industry professionals, post-secondary educators, therapeutic riding instructors, business & industry professionals, family members and riders. The theme of the event was “A Model of Inclusion for all Riders”. Participants also received Continuing Education credit for 16 hours of professional development. The 3- day workshop brought a diverse group of stakeholders together to explore opportunities for engagement and expansion of current or new riding programs and learn about NSBA competitive events for the inclusion of Equestrians with Disabilities or Veterans using horses as a form of therapeutic riding. Financial stipends were provided to interested applicants to offset travel, lodging and meals at the conference. As a special project of the NSBA Foundation, the work shop was funded by Gutmann Farms- Texas, the Curt & Beth Hartman Family and WinTrust Bank. The National Snaffle Bit Association Foundation’s Equestrians with Disabilities and Heroes on Horses, serving our military Veterans, are two of five programs administered by the National Snaffle Bit Association Foundation. NSBA’s Equestrians with Disabilities and Heroes on Horses provides a competitive platform for all riders to participate in. The NSBA related events compliment the work of PATH, Intl. (PATH) and are open to any age rider in Western and English disciplines. Photo Credit Rachel Reilly Photography. Participants worked together talking about industry need, best practices and brainstorming ideas for bettering EWD and Veteran riding participation. While at Partners for Progress, presenter included not only horses and therapy professionals, but also parents, volunteers and those who both contribute to and have the most to gain from the program. Amanda Cleveland, TR Potts and Jamie Herwald led the demonstration at Partners for Progress, a Therapeutic riding center that provides over 200 therapy sessions per week. . The Coaches Summit was presented as a special project of the NSBA Foundation with special thanks to our donors who provided funding for the event; Curt & Beth Hartman Family, Gutmann Farms - Texas and WinTrust Bank.